OK, now I "get" escarole. With two bunches to deal with, I had to find something to try. I stumbled across a recipe for Escarole with Capers and White Beans in a newly acquired cookbook Veganomicon (see page 107). 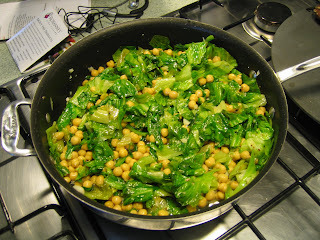 The recipe is extremely easy and makes quick use of a lot of escarole. Saute a small handful of chopped garlic in some olive oil. Add red pepper flakes and coarsely chopped escarole -- saute till wilted. Add beans (we used chickpeas), capers and some brine -- heat through. We served over whole wheat pasta with a side of baked carrot fries, but this would be fantastic over brown rice or stirred into a simple Parmesan risotto. For the cabbage I really recommend Andy's Favorite Cabbage. I made that tonight and it was really excellent. One enhancement that I think would be worth trying would be to top it with some whole peanuts.